Starting in June of 2016, Santa Monica Music Camp will also hold an intermediate/advanced sleepaway session in Temescal Gateway Park at the Santa Monica Mountains. 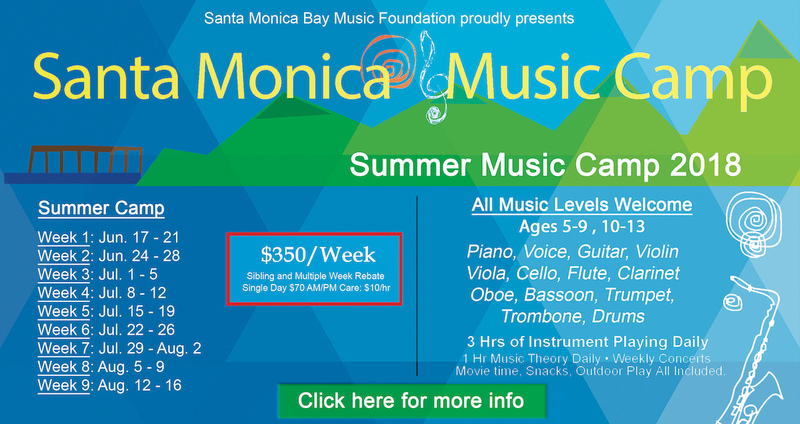 Since 2001, the Santa Monica Music Camp has provided Summer music day camp to children in West Los Angeles; Pacific Palisades, Brentwood, West Los Angeles, Mar Vista, and Venice. 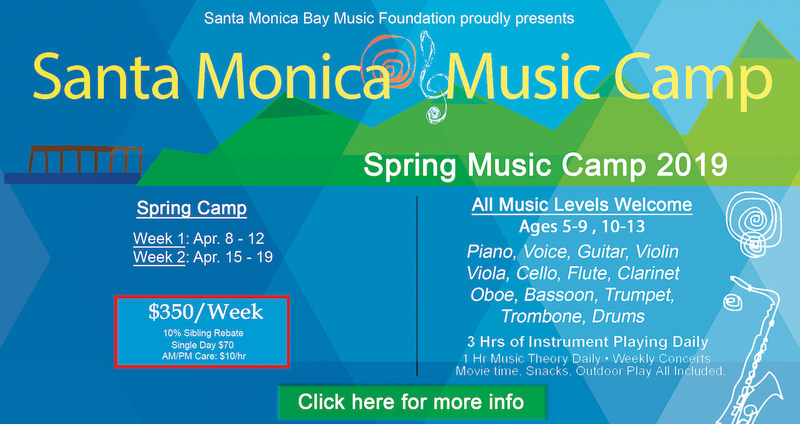 In addition to the summer day camp, the Santa Monica Music Camp is now held during the Winter and Spring Breaks within the Santa Monica-Malibu Unified School District Calendar. Our Beginning Day Camp is held on weekdays from 9:00 a.m to 3:00 p.m, and Advanced Day Camp from 11am-5pm. We offer before & after care hours for parents with busy schedules. What Sets SMMC Apart From Other Camps In The Area? Is SMMC a Safe Environment For My Children? My Child Doesn’t Play Any Instruments. Can He/She Still Attend Camp? What Are the Recommended Ages for Beginning and Advanced Camp? What Is the Cost of SMMC? Does My Child Need To Bring His/Her Own Instrument? Can you accommodate early drop off or late pick up? Experts agree that playing music at a young age enhances aptitude for math, language, and social skills. At the Santa Monica Music Camp, children participate in a variety of fun and educational activities; they learn composition and theory skills in theory class, how to play and collaborate in chamber groups, and instrument specific knowledge that can help them improve even after camp. They also play fun games that improve their aural and rhythmic skills. Our camp counselors are professional, working musicians and music teachers with years of experience. All are college educated, with degrees in music. They are highly skilled musicians and educators with a genuine love of teaching. All of our staff and faculty members are background-checked and TB-tested. They are also required to have a current CPR and First Aid certification. Our location hosts children 12 months a year for camps and private music lessons. It is child proof, yet fun and modern. We always have an employee working the front desk by the main entrance, keeping an eye on who comes in and goes out. Our staff are vigilant and prepared for any medical, musical, or personal needs that may arise. No previous experience in music is required to join the Beginning Music Camp. When campers arrive, their instructor evaluates them through the daily activities and groups them with students of similar ages and levels. Our staff has years of experience teaching advanced students and complete beginners. Children of all levels and skills will feel at home in one of our two camps. Our campers ages range from 4 to 14 years old. Beginning camp is recommended for elementary school kids, ranging from 4-10. Complete beginners are welcome, as well as students with a few years of playing experience. Advanced camp is recommended for advanced middle schoolers and up. They should have a comfortable mastery of their instrument, including all major and minor scales. A week-long session of Music Camp is $350 (5 days). Our single-day rate is $70. After-care (AM-PM) is $10/hr on the top of the hour. The Santa Monica Conservatory of Music provides fifes and keyboards to students during camp hours. We also rent guitars, violins, and violas to camp students for $25 a week. If your child wants to join our camp but doesn’t own an instrument, please let us know ahead of time and we can reserve a rental instrument for them. For any other options, there are local music shops where you can rent an instrument for the week or month. For string Instruments, we recommend Bennings Violins in Studio City. For Brass and other instruments, the Santa Monica Music Center at 1901 Santa Monica Blvd. Yes! We offer early care from 8am-9am, and aftercare from 3-6pm. Simply let us know which days you will require extra care and at what time. You can pay in person that day, or we can charge it to your credit card. It costs $10 for each hour. Because of staff limitations, extra care does not include planned activities; it is a safe way to stay at school under adult supervision. We have some books, art supplies, and music games, but we recommend bringing books or other games to keep your child happy. What is the Age Range of Campers? Who Are Your Staff, and What are Their Qualifications? Is Sleepaway Camp a Safe Place for My Child? Santa Monica Music Camp hires the best and brightest teachers, counselors, counselors in training (CITS), and administrative staff. We have at least one head teacher per instrumental group (Voice, Winds, Brass, Violins and Violas, Cellos, etc). These teachers are assisted by counselors and CITs in ensemble and sectional rehearsals, who are young and talented musicians. Campers will have multiple rehearsals per day lead by their head teachers. Each cabin is lead by one counselor and one CIT. Counselors are at least 18 years old, while CITS are mature high school students between the ages of 15-17. Together, the counselor and CIT provide supervision, support, and leadership to the group of up to ten campers in their cabin. All of our staff are thoroughly background checked, checked for tb, and trained in CPR and first AID. There will also be a nurse or EMT on site at all times. Getting homesick is a normal experience for some campers on their first day (or days) of camp. Luckily, most campers start adjusting on their first day as they make friends and feel accomplished on their instruments. Should your child need some reassurance, all of our staff are trained to discreetly and respectfully handle any emotional issues campers may have. Students attend a meeting with their counselor and CIT in the first hour of camp, in which they learn about how camp works and are encouraged to speak publicly or privately with any and all staff about their experiences. If necessary, an encouraging talk with parents is just a phone call away. Absolutely! We take the safety of our campers very seriously. We will have a certified EMT or nurse on staff and on location 24/7 whenever camp is in session. We have a great teacher/ camper ratio of 1:8, not including counselors and counselors in training (CITs).